Treating acne? Is it time to get help? Are you suffering from acne and acne scars? You are not alone! Acne affects about 50 million men and women every year and Americans spend $3 billion annually to treat acne. Acne is not just a problem for adolescents as many adults are affected by acne which can have negative psychological effects on one’s self-esteem. Why Select A Board Certified Dermatologist To Diagnose And Treat Your Acne? At BAXT CosMedical®, you will be seen by one of our Board Certified Dermatologists who have many years of experience treating acne patients of all ages and types-adults, children, women, men, severe acne, hormonal acne, food-related acne, you name it, we have seen it and treated it and made it better. You will not see the assistant, PA, nurse practitioner or aesthetician, as is commonplace in many offices and spas around the country. All of your acne care is delivered by Dr. Rebecca Baxt and Dr. Saida Baxt who are Board Certified Dermatologists and have advanced education, training and experience in treating acne and acne scars. 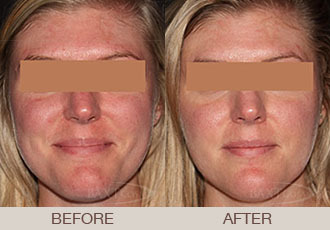 It is not uncommon for us to see acne patients who have seen many other doctors before they come to us. We also see patients who have tried to treat their acne on their own and have wasted money and time on ineffective and often skin damaging treatments from the Internet and stores. Is it time to get expert advice and successfully treat your acne and obtain clear and healthy skin? Call BAXT CosMedical® to schedule your consultation. What Is The Consultative Process And What Type Of Treatments Are Offered? During the consultation we will review all prior treatments of all kinds, as well as your history, acne triggers, and do a physical examination. Please bring a list or photos of your prior medications with ingredient list if necessary. Please think about any acne triggers that you might have (food, hormonal fluctuations, stress, travel, etc.). We offer a variety of acne programs including skin care, chemical peels, acne injections, acne surgery, as well as many laser and light procedures. At the consultation we will also discuss more aggressive forms of acne treatments, both pills such as antibiotics, or hormonal medications such as birth control pills or spironolactone. Accutane or isotretinoin is also on the list of medications we prescribe if necessary and we walk you through all the necessary steps. Many patients do not want to take oral medication of any kind, and we have many laser and light procedures that work extremely well. We offer Photodynamic Therapy with either blue or red light, Isolaz® Acne Treatments of intense pulsed light and suction to kill bacteria and unclog pores, as well as Smoothbeam laser which is FDA-approved for acne and shrinks the oil gland. Acne scars are among the most common complaints that we address. There are many types of acne scars including red marks, brown marks, and indented scars, as well as, hypertrophic scars. We have lasers, peels, creams, injections, PRP facial rejuvenation treatments and fillers to address all of these issues and can go over all options with you at your consultation. All of our patients leave the consultation with a great, easy skin care program that fits their lifestyle and a budget tailored specifically for them. We are used to needing to make acne regimens affordable. We cannot always cure acne, but we can always make acne better. We can teach you how to manage it so it does not control your life. We look forward to seeing you and helping you with your skin! For Unmatched Expert Medical Dermatology Care For Acne And Acne Scarring, Contact Us Today!